I’ve been quite lucky and I know a lot of fellow mums will be annoyed AF but Lily has slept through from about 3 weeks old. I used to have to wake her sometimes for a feed in the early days. I knew I wanted a Ewan the dream sheep because I thought they were adorable, which is true and I also knew babies slept better with white noise. I have other family members who used to keep the radio on static to help their little ones go to sleep. When you first see it you think wow nearly £30. But from my experience I would happily pay it and if anything happened I wouldn’t hesitate to get another. I just want to point out this isn’t a sponsored post. I have always recommend people to buy Ewan and felt over the last few weeks I needed to share my experience. I also wanted to start upping the amount of parenting posts I do. From when Lily was really little she would go to sleep for a nap or to bed and have Ewan on with the heart beat and womb noise. I should point out each foot is a different sound, one is womb sounds, one is music, one is like a vacuum and the last is like rainfall. They all have a heart beat sound in the background. There is also a pink glow that comes through the tummy, I assume its to represent from being in the womb and it makes the babies feel more calm. I would play it about 3 times which is an hour as each sound plays for 20 minutes time and it would normally get her into a nice deep sleep. On the occasion she does wake up I would just put Ewan back on with the womb sounds and she would stare at it for a bit and drift off. Lily is nearly 14 months now and I had stopped using it for a while as the batteries ran out and I just thought ‘oh she will be fine now’. She has been getting up a lot lately and been having trouble sleeping as she’s been poorly for a while with catching different bugs one after another (nursery will do that to them) and then teething. I thought, one night I’ll just put her in the cot and see if she will settle by herself and she didn’t. I gave her Ewan and put on the music and she just laid with it stroking his ears and looking at the red light and fell asleep after about 5 minutes. I’ve been doing this again with the music when she’s woken up, sometimes after having a bit of teething gel and again off she goes. She cuddles him and puts her arm over him, it’s just the cutest thing. Get ready to see a cute picture of Lily when she was tiny! She’s always adored Ewan. I definitely think that this sheep has contributed to how well Lily has always slept. 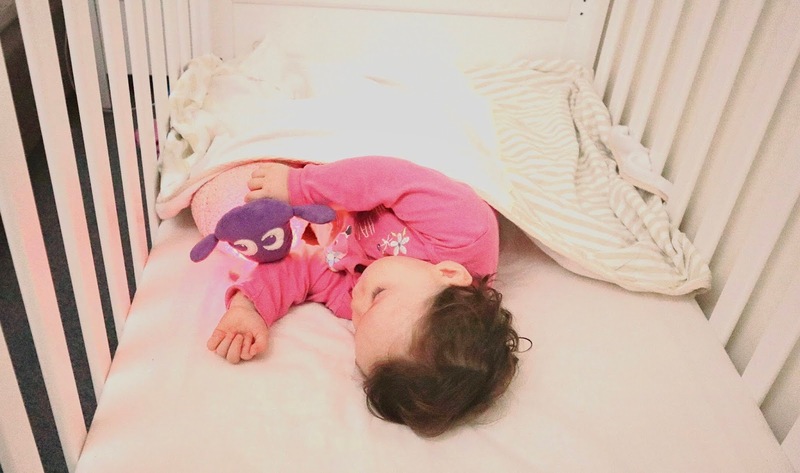 She will wake up like all babies, when they aren’t well or teething it is inevitable but this can help her settle back to sleep by herself really quickly. The velcro on his tail has ripped off now so I just tie his tail around the cot bars or she cuddles him. *Also just wanted to say when she was very little he was always on the top of the cot or next to her not in the moses basket. I know toys and teddies don’t go in with them when they are sleeping. Have you ever tried Ewan? Whats the best things that help your little ones get to sleep? Let me know in the comments below! It is so good! I would always recommend it.